O. B. L. Kapoor, Ph.D., has served as Head of the Philosophy Department and Dean of the Faculty of Arts at B.R. College in Agra, India, as Principal and Head of the Philosophy Department at K.N. Government Postgraduate College in Varanasi, as Principal of the Government college in Rampur, and as a member of the Executive Council of Agra University. He has been residing in Vrndavana since his retirement in 1967 and is engaged at present in writing books and articles concerning the teachings of Sn Caitanya Mahaprabhu and His disciples. He was initiated in 1932 by His Divine Grace Sri Srimad Bhaktisiddhanta Sarasvati Prabhupada, by whose order Back to Godhead was first established in 1944. Even though each dhama is infinite and all-pervading, the dhamas are said to be situated one above another. Situated above the mundane sphere, which is graded into fourteen worlds-the seven Lokas and seven Patalas-and beyond the River Viraja, is the Brahmaloka, or Siddhaloka, which is the residence of all the freed (mukta) souls (Cc. Madhya 19.153). Above the Brahmaloka is the paravyoma, where the infinite avataras, or partial manifestations of Krishna, reside, and which is the support of infinite spiritual regions called Vaikunthas (Cc, Adi 5.15). Above all these dhamas is Krishnaloka (Krishna’s abode), which, according to the differences in Krishna’s pastimes (lilas) and associates (parikaras), appears in three different forms-as Dvaraka, Mathura and Gokula (Cc. Adi 5.13). Gokula, the highest of the three, is also called Vrndavana because Vrndavana is the central portion of Gokula. The situation of the dhamas above or below each other should not, however, be taken in its literal sense. It actually implies their gradation according to their excellence (mahima). The excellence of a dhama depends on the degree to which it manifests the highest dhama, Vrndavana. Thus the excellence of Siddhaloka is greater than the excellence of the phenomenal world, the excellence of paravyoma is greater than the excellence of Siddhaloka, the excellence of Krishnaloka is greater than the excellence of paravyoma, and the excellence of Gokula is greater than the excellence of all the rest of Krishnaloka. The excellence of Vrndavana is the greatest of all. In the Rg Veda (1.154.6) Vrndavana is described as the highest dhama (paramam padam) of Visnu. 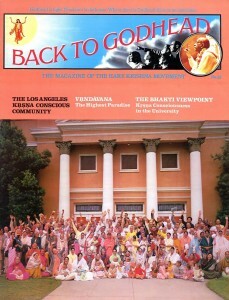 The Bhagavatam also describes it as the highest dhama. In the Gita Krishna Himself describes it as “My highest dhama.” ** (yam prapya na nivartante tad dhama paramam mama (Bg. 8.21)) It is so described because it surpasses all other dhamas in grandeur (aisvarya) and sweetness (madhurya). But its peculiarity is that its sweetness completely eclipses its grandeur, so that everything here assumes a form sweet beyond expression. 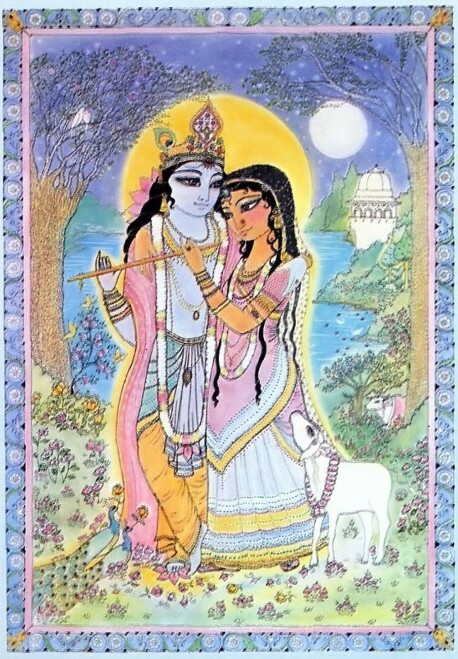 Krishna does not appear here as God or even as a king, but as a cowherd boy with the crest of a peacock feather on His crown and a flute in His hand, eternally engaged in amorous pastimes with His consorts on the bank of the River Yamuna underneath the kadamba trees and in the green groves; laden with sweet-smelling flowers, all of which breathe an atmosphere of freedom ‘and sweetness most congenial to Him and His consorts. 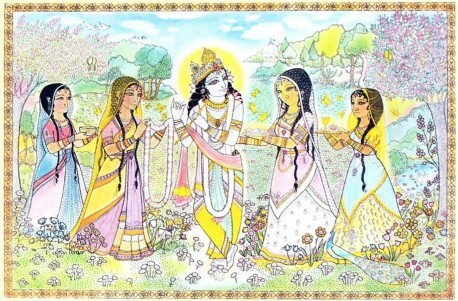 Indicating how Krishna is inseparably connected with Vrndavana in His highest aspect, which fully displays His sweetness, Radha, to whom even a moment’s separation from Krishna is unbearable, is not satisfied to find Him in Kuruksetra, where He appears as a king with His entourage and not as a cowherd with His flute (Cc. Madhya 1.72-73). She is also not satisfied to find Him in Nava-vrndavana, a replica of Vrndavana specially prepared for Her in Dvaraka, because it lacks the atmosphere of freedom and the charm and grace so natural to Vrndavana and is therefore not conducive to the highest bliss She is accustomed to experience in the company of Krishna in Vrndavana. The celestial Dvaraka, Mathura and Gokula (Vrndavana) have their replicas on earth [in India] in the forms of the geographical Dvaraka, Mathura and Vrndavana, which are known as their prakata-prakasas, or manifest forms. These appear as parts of the phenomenal world to our clouded vision, but are in essence identical with their Celestial counterparts. Here also Krishna is eternally present with Nanda, Yasoda and His other associates and performs His pastimes with them as in the celestial Dvaraka, Mathura and Vrndavana. If we could see them with spiritual eyes, they would without a doubt appear in their true form (Cc. Adi 5.20-21). Even today, while staying in these very abodes and in their very bodies, the devotees who attain accomplishment (siddhavastha) in devotion are blessed with the vision of the divine pastimes of Krishna with His associates; such devotees need not be transported to any other abode or level of existence. 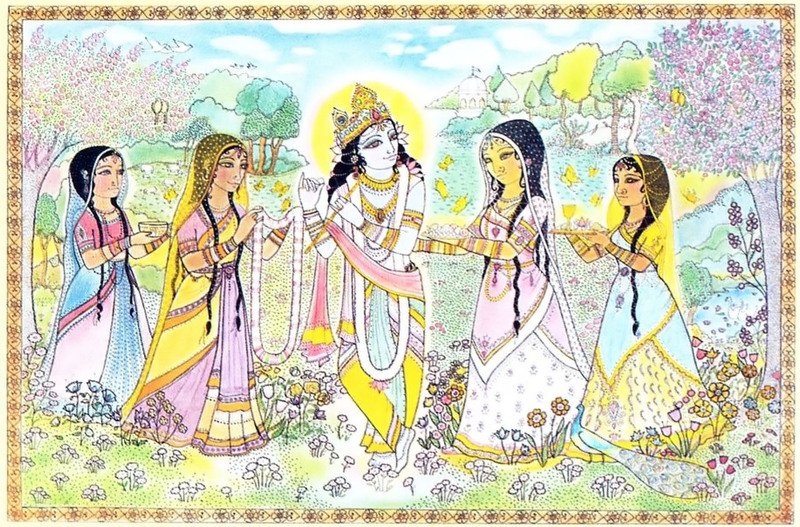 When Krishna descends to these abodes, however, at the time of His manifest pastimes (prakata-prakasa), even those who are not devoted can see these pastimes in their true form. Such is the effect of the divine touch of Krishna with these abodes, which otherwise appear phenomenal. Besides the manifest forms of Krishnaloka, there is also an unmanifest form of it on earth that has the peculiar power of always remaining invisible; it remains on earth without touching it. Thus there are two aprakata-prakasas (unmanifest forms) of Krishnaloka. One is the Krishnaloka situated above paravyoma, which is called by various names: Goloka, Gokula, Svetadvipa, Vrajaloka or Vrndavana. The other is the invisible Krishnaloka situated on earth, which is different from the prapancika, the phenomenal Krishnaloka visible to our material eyes and actually touching the earth. It is also called Gokula or Vraja. Rupa Gosvami states in Laghu-bhagavatamrta (1.277.78) that Goloka is a majestic manifestation (vaibhava-prakasa) of Gokula, which is essentially sweet in appearance and therefore greater in excellence. As an instance of the majesty (vaibhava) of Goloka, he cites the Varaha Purana, which says that the kadamba trees of Goloka spread out majestically with their hundreds of branches, which is just in keeping with its aisvarya (opulence), while the kadamba trees of Gokula are medium-sized, which is in keeping with its madhurya (sweetness). A special reason why Gokula excels Goloka in sweetness is that in Goloka Krishna is present eternally without birth, on account of which His pastimes in Goloka differ in certain respects from the sweet human aspect in which they reveal themselves in the phenomenal Gokula. Brahma-samhita describes the pastimes of Vrndavana as nara-lila (manlike pastimes) and those of Goloka as deva-lila (Godlike pastimes). This theory is supported by the rasa dance in Goloka, which Krishna is said in Brhad-bhagavatamrta to have performed on the head of Kaliya Naga, the thousand-headed cobra, although there is no mention of this in the Bhagavatam. According to Jiva Gosvami also (Gopala-campu, Purva-khanda, 19), Goloka is the majestic manifestation of Vrndavana. He describes Vrndavana as the inner side (antar-mandala) of Goloka, and Goloka as the outer side (bahir-mandala) of Vrndavana. But they are not the outer and inner side of each other in the physical sense, for it is possible to see Goloka in Vrndavana (because Goloka is the majestic manifestation of Vrndavana) but not possible to see Vrndavana in Goloka (Krishna-sandarbha, 116). According to Rupa and Jiva, (Bhakti-rasamrta-sindhu, Tika 1.4), Goloka can be attained by vaidhi (ritualistic) bhakti, but Vrndavana can be attained only by raganuga bhakti, or bhakti flowing spontaneously like a current, disregarding the rules and regulations of ritualistic bhakti. This is a further indication of the difference between the two abodes. 1. Although Sanatana Gosvami regards Goloka and Vrndavana as identical, it is clear from his tika on Brhad-bhagavatamrta (2, 5, 78-79) that Vrndavana is the marma-taramsa of Goloka, or the part of Goloka that supersedes the whole in excellence. Thus we may conclude that there is essentially no difference between Goloka and Gokula (Vrndavana). Goloka is a particular manifestation of Vrndavana in which sweetness predominates, but not to the extent to which it predominates in Vrndavana. It is therefore called the majestic manifestation of Vrndavana. Vrndavana is attained by spontaneous devotion, whereas Goloka is attained by ritualistic devotion. The greater the dominance of spontaneity, the fuller the realization of Goloka’s sweetness. ** (This is in accordance with the principle: yadrsi bhavana yasya siddhir bhavati tadrsi.) But when spontaneous devotion is pure, Goloka is realized in its highest aspect which displays sweetness fully and is called the inner side (antar-mandala) of Goloka. In this aspect Goloka is identical with the phenomenal Vrndavana, and the sweetness displayed here is the same as that in the phenomenal Vrndavana, except for the difference caused by Sri Krishna’s always being present in Goloka as a young boy of tender age (nitya-kisora), although in the phenomenal Vrndavana He takes birth and gradually attains boyhood.